I don't know about you, but the first week after a school holiday is always a bit of a jumbled up week for me. It takes me a while to get used to having the house to myself again, to catching up on washing and jobs, and this last week was no exception. The only good thing is that I've been able to finish off quite a few things that were hanging around. First - and most exciting - I passed my Master's degree with a merit and my certificate arrived in the post to be displayed on the wall in all it's academic glory. 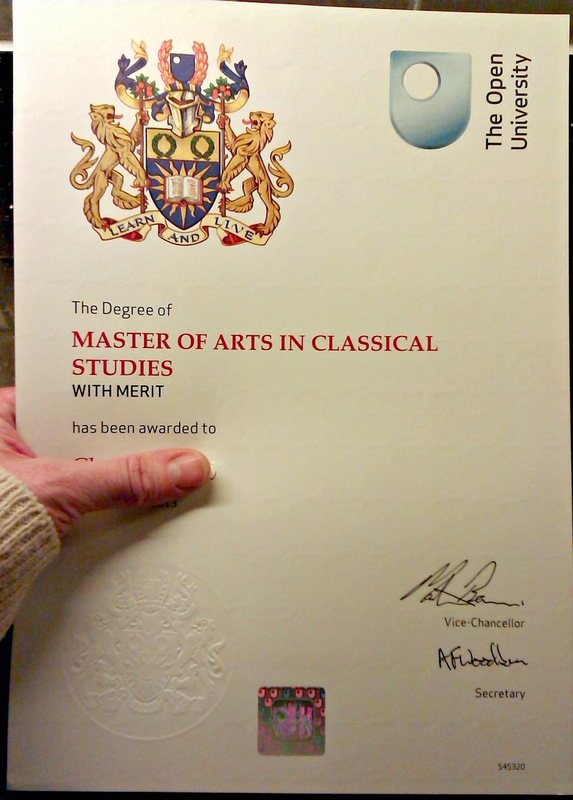 I am now officially an MA (Class Stud) (Open) which sounds very grand, but don't worry, I won't let it go to my head! 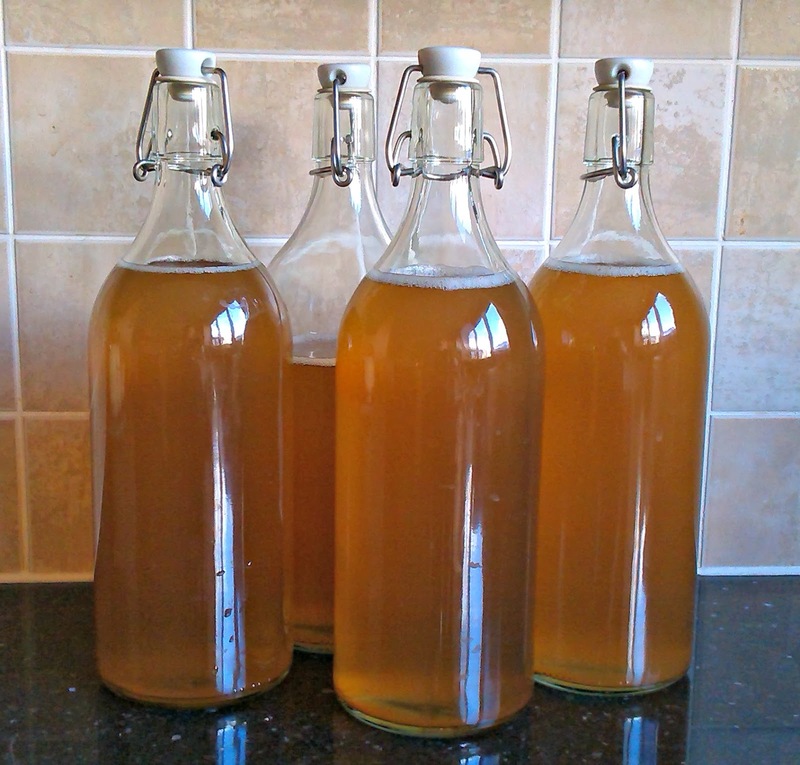 I've also bottled the nettle beer and elderflower wine that I started back in July - I bet you thought I'd forgotten about it! 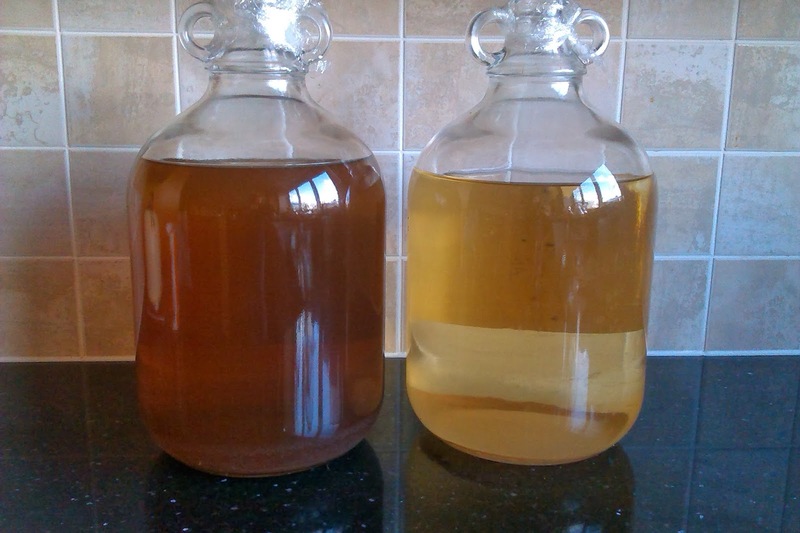 And, to be honest, you'd be right - the demijohns got pushed to the back of the shelf and have been fermenting nicely on their own for a very long time. I bottled the wine first and got five bottles plus a glass out of the demijohn. I also got a fairly big mouthful when I started the siphon off and I have to say, it's nicer than I expected it to be. That sounds dreadful, doesn't it, but my last attempt at fruit wine many years ago was not particularly successful. 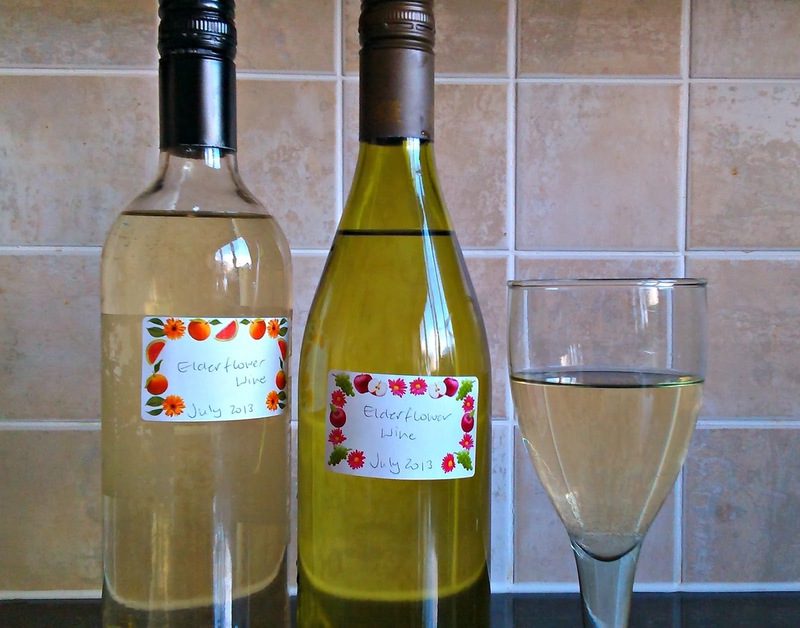 This wine tastes of elderflowers and has turned out pretty much as the recipe book described it. Of course, as any scientist will tell you, one experiment isn't enough so I will be finishing off that extra glass of wine tonight to see if the rest of it is as nice as that first mouthful! Then onto the beer. It was pretty frothy as it was pouring into the bottles so I'm hopeful that it won't be as flat as a pancake when we finally come to drink it. I bought 1 litre bottles in the end as it was cheaper to buy them in that size from IKEA than buy smaller ones by mail order, and if it's terrible beer I won't be making it again which would be a waste of bottles. The good thing about the larger bottles is that it's a good excuse for my husband and I to share. After such a rotten winter, I'm hoping that we get a decent summer. Last year's hot weather meant that my husband and I were able to sit out together in evenings for much longer than usual and I think that nettle beer would be just the drink to have at hand. I've also been busy with the sewing machine. As I'm doing more sewing, I'm getting faster which makes it more enjoyable. 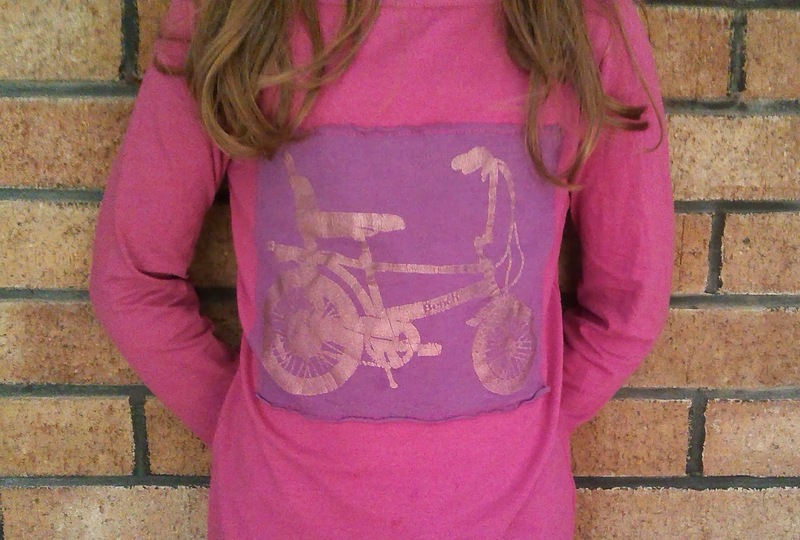 I upcycled an old t-shirt of mine into a new top for small daughter by cutting out the picture and sewing it onto a long-sleeved t-shirt. Small daughter has always liked this t-shirt so it's nice to be able to give a new lease of life and for her to be able to wear it for herself. 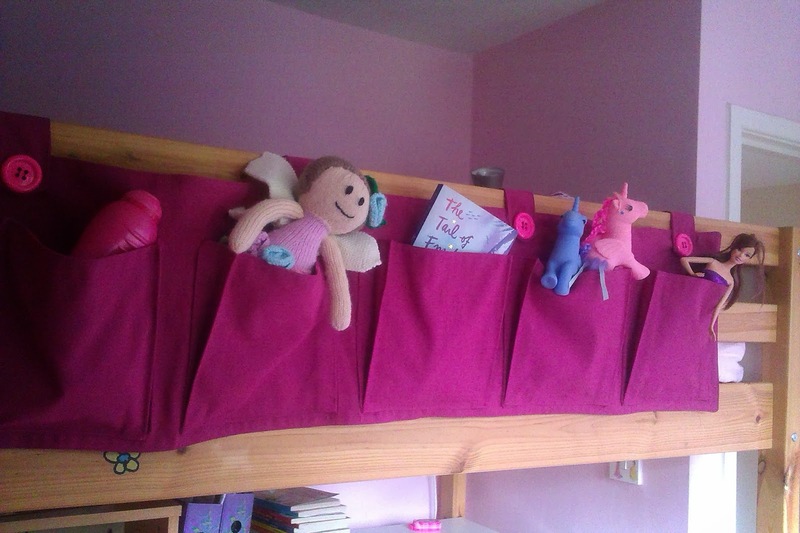 It's an organiser for small daughter's bunk bed so that all of the bits and pieces that she stuffs under her quilt (and which make it a nightmare to change the sheets) could be put out of the way. I've been intending to make one of these since the days when small daughter's bed belonged to big daughter, but it's only been with my newly-gained sewing skills that I've felt up to the challenge of working out how to do it. 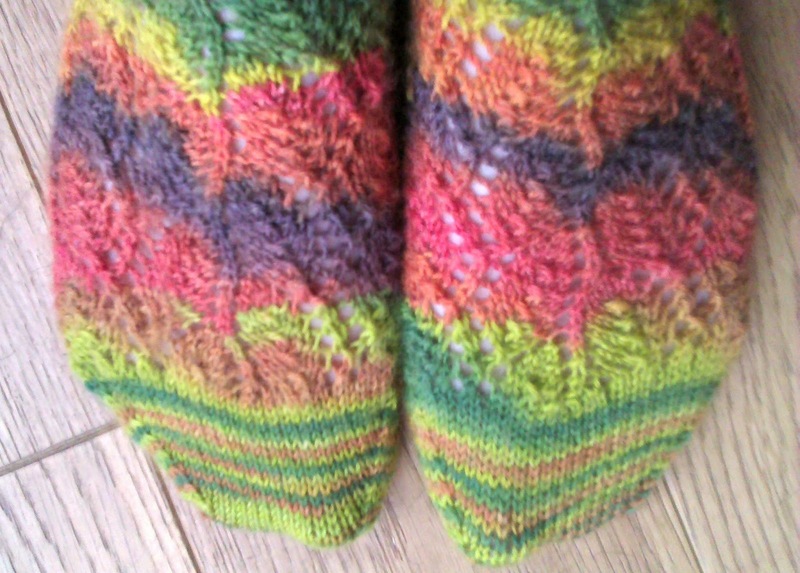 Finally, I've finished the pair of half-knitted socks that I've been working on forever. This ball of yarn just couldn't decide what it wanted to be, so in the end I designed my own socks using a shawl pattern I found on Ravelry. The lady who designed the original shawl pattern has kindly said that I can post my sock pattern as a tutorial, so as soon as I've written that up I'll be putting it up on the blog. Phew! It feels good to have been able to bring all of these projects to a close - although the space they have left has quickly been filled by something else! A new pair of socks is on the needles, I have more sewing project ideas that I want to work on, more blog posts ... life is certainly never dull! What a lovely afternoon it's been! We're on half term here so it meant a whole afternoon in the garden without having to break off to do the school run. Big daughter went into Manchester with a friend so it was just small daughter, me and the dog - for a while, until he broke through the hedge into next door's garden and had to go back into the house in disgrace whilst I did some emergency hedge repairs. We've got relatives coming to stay with us this weekend, so I wanted to get the garden tidied up a bit just in case the weather is good enough for the children to play outside. The storms have brought down small branches from the trees, blown leaves everywhere and there is just general garden mess that I haven't had much chance to get out to tidy up until now. It was one of those days to bring out the big guns so out came my shredder. I love my shredder. I love how it turns garden waste into something useful which either goes into the compost bin or onto the borders as mulch. I'm almost ashamed to admit that one of the first things that got cut up to go into the shredder was the Christmas tree. February and the Christmas tree was still in the garden! That's the problem with real trees - they come wrapped up in nets and after Christmas they're fully open with needles dropping everywhere. 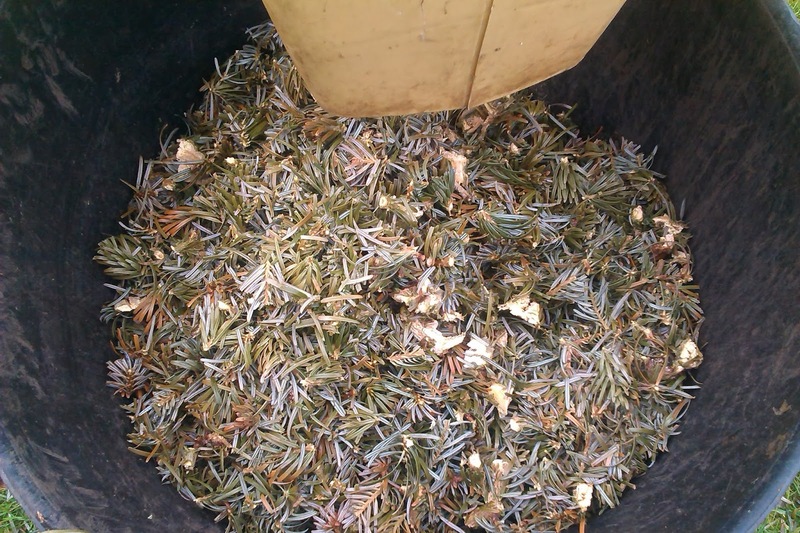 It might be easy enough to put it in the car to take it to a recycling centre, but you know that you'd be picking up pine needles for the rest of the year! 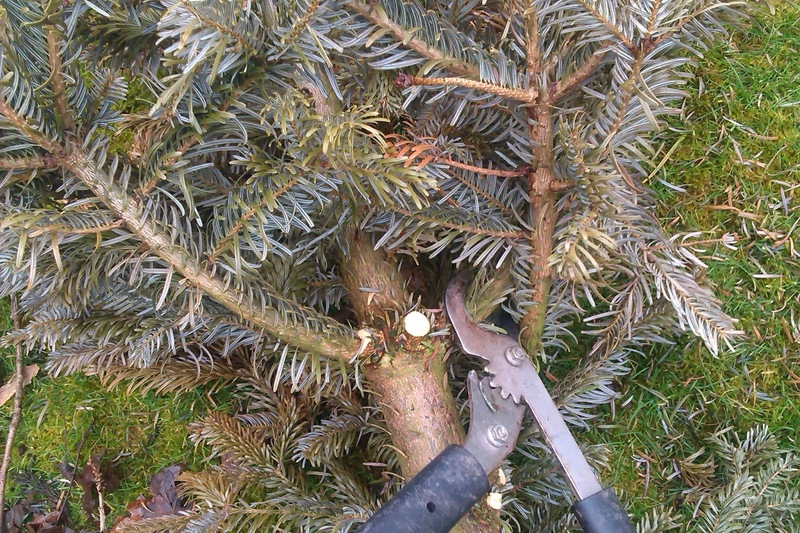 After so long, the tree was pretty dry so cutting it up wasn't a problem. And then - oh boy - I forgot to feel ashamed as the smell as the tree went through the shredder ... it was just so Christmassy and generally wonderful! I loved the way that the needles were shades of green and silver, so they even looked a little bit Christmassy too! It put me in such a good mood that it seemed that all afternoon I was finding more treats in the garden. A few tiny houseleek, hidden in a pot full of dead things. Houseleeks are amongst my favourite rockery plants. 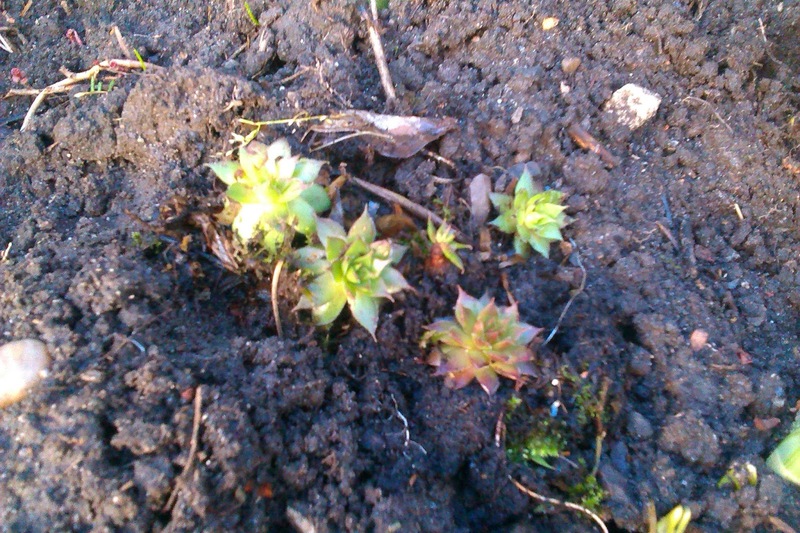 I was so pleased to find them and they're now heeled into a patch of earth ready for re-planting later in the year. My whole garden needs some serious work - borders re-building, plants dividing and re-planting. I'm hoping that there will be enough plants already in the garden that I can split to save me too many expensive trips to the garden centre - because I do find it hard to resist buying plants! 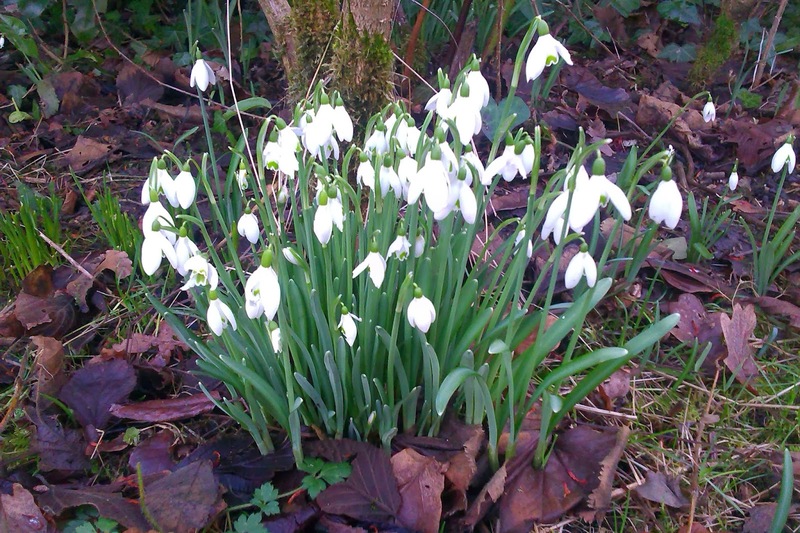 The snowdrops are in full bloom now. 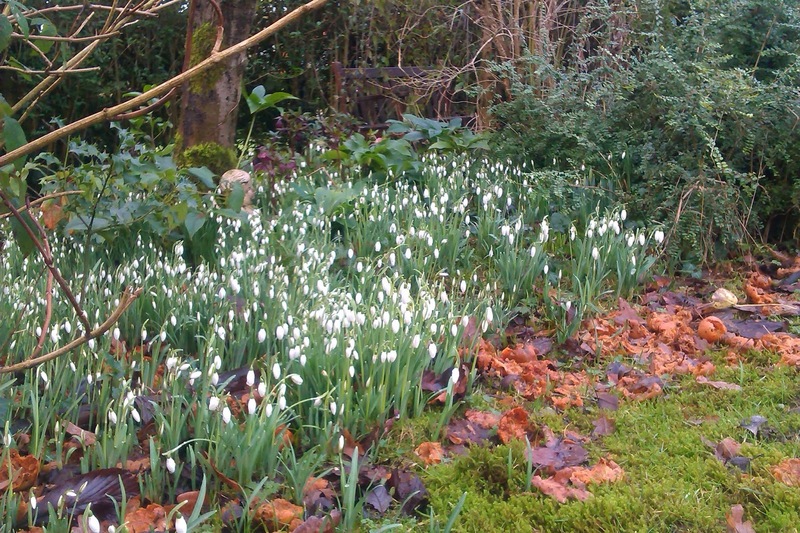 There are patches of them all over garden, and their little white and green nodding heads are just a joy to behold. 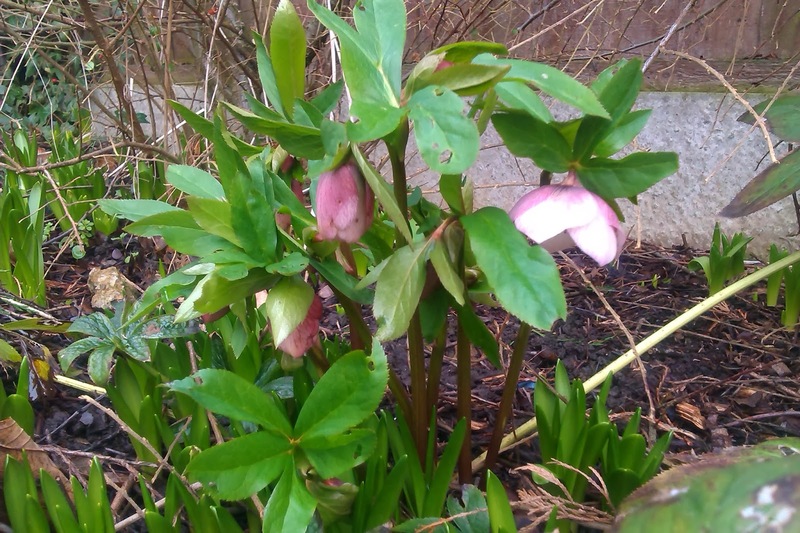 I've got quite a lot of hellebores in the garden. 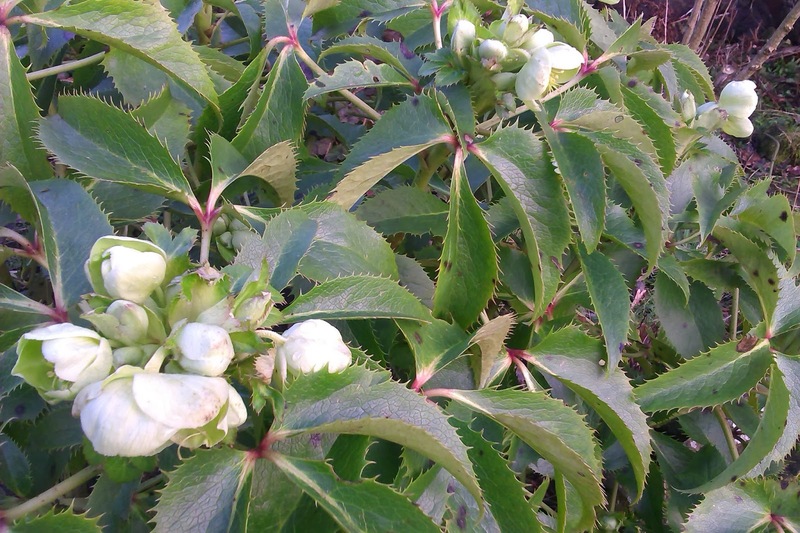 This on is Helleborus angustifolia or Corsican hellebores, one of the largest varieties. 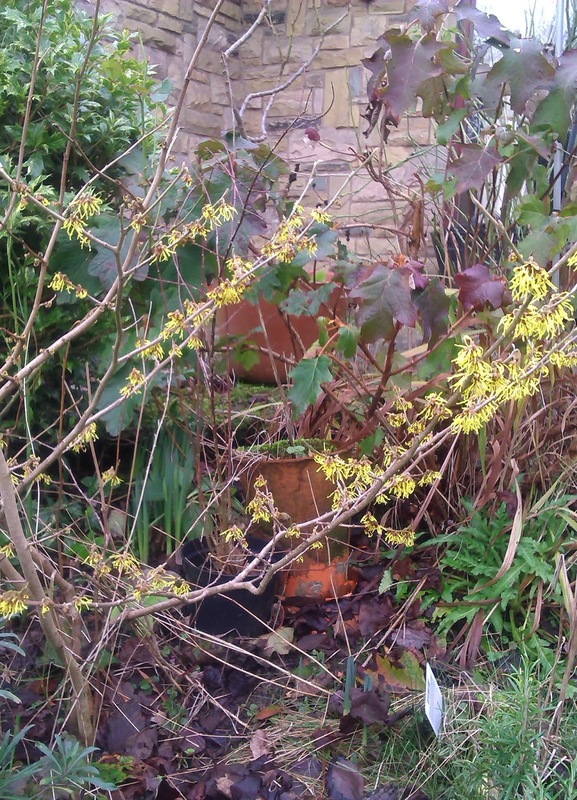 It's just full of green blooms at the moment, with shiny toothed leaves. 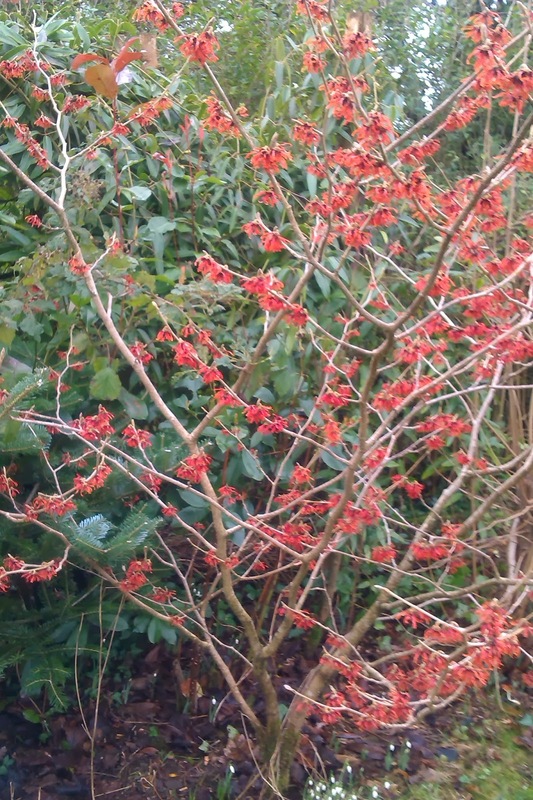 They can cause irritation and you should always wash your hands after touching them; they're one of the few plants that you have to treat with caution that I have in the garden - after all, poisonous plants in a garden where children play is not always the best idea! Foxgloves are another one that thrives, but the girls have learnt from an early age not to put anything in their mouths that they find in the garden unless they've been told it's safe. This picture was taken at about four thirty in the afternoon. It was only a few weeks ago that it was dark at four thirty, but I just love the blue sky in the background of this picture. 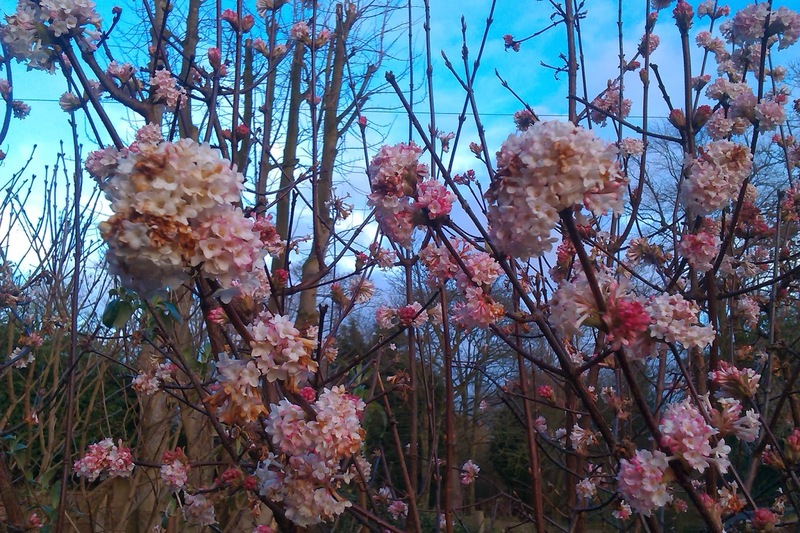 This is Viburnum bodnantense "Dawn", a winter-flowering viburnum with the most beautifully fragranced flowers. 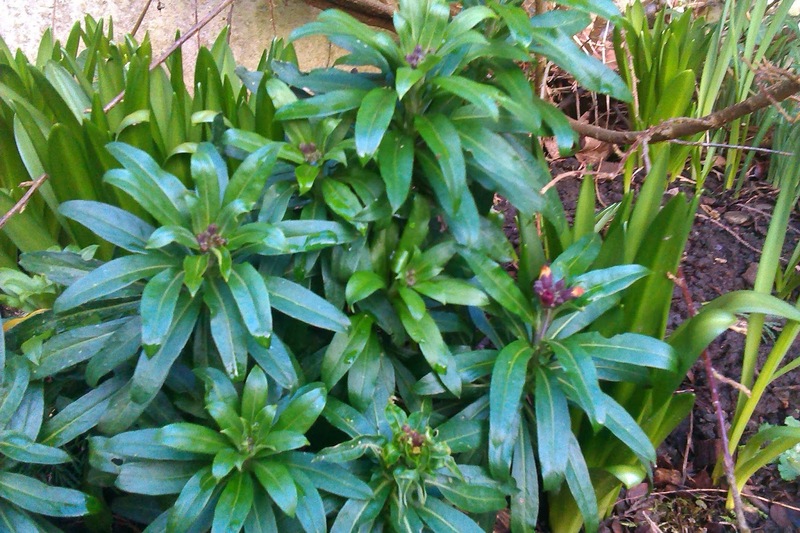 And finally, just on my way back into the house, I noticed that the self-seeded wallflowers are just about to break into flower. Another few days and they will be riotous shades of orange and purple with a powerful scent. By the time the light finally started to fade and it was time to meet big daughter off the train, small daughter was exhausted from alternately helping me and practicing her roller-blading skills along the path. We may not have done much out of the ordinary on this half-term holiday day, but the time we have spent outside together has been lovely, and I'm sure we'll both sleep well tonight. 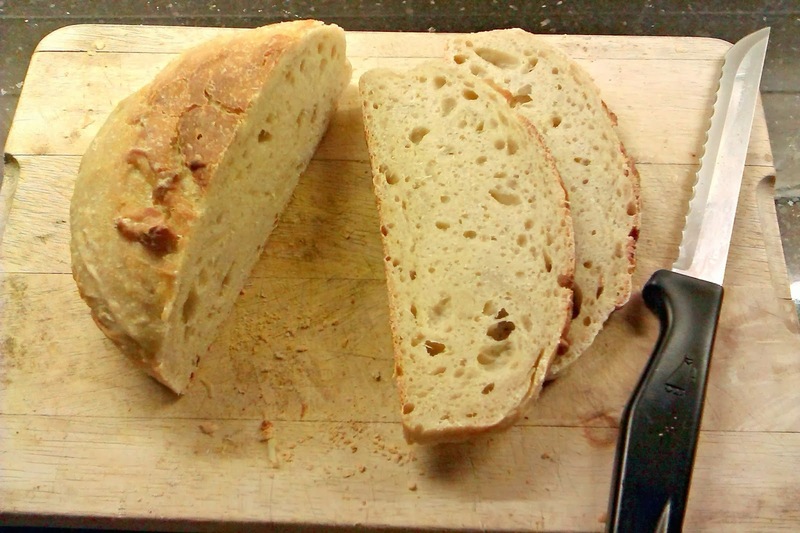 Back in November, I decided to start making my own sourdough bread and wrote about it here. My first attempt was great, but I have to confess that subsequent loaves weren't quite as good as that first one. Not one to be beaten by such a thing, I decided to work out why this might have been the case. I spent a long time looking for the answers on the internet and an even longer time making more loaves that just didn't seem to work out. And the problem with a sourdough loaf is that it takes so long to make that by the time your fourth loaf has gone out in the garden to feed the birds (yes, I must claim responsibility for some rather heavy-looking birds!) you do start to feel a bit disheartened. 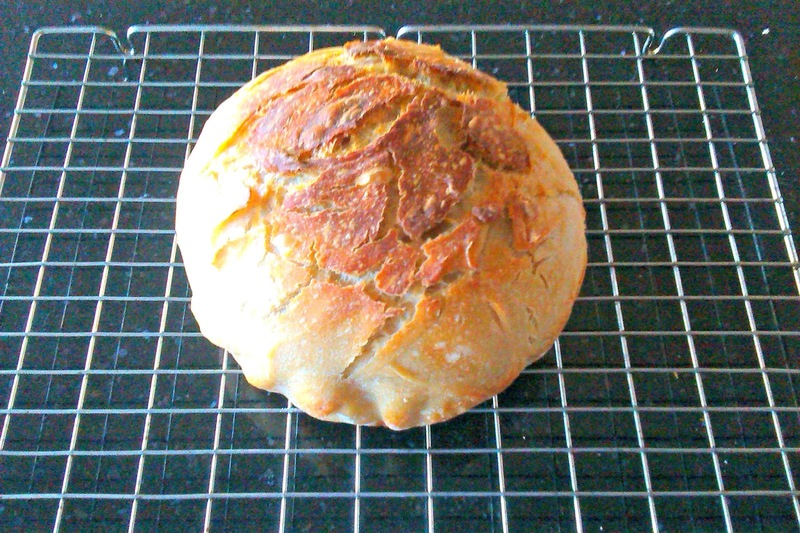 Then I came across a post on Lucy's Attic 24 blog for no-knead artisan bread. This appealed to me immensely as I thought that cutting down on the preparation time and not ending up getting covered in ridiculously sticky dough might go some way to solving the problem, or at least, ease the disappointment. I searched a bit further and discovered Breadtopia's no-knead sourdough bread and thought that at last I had the answers! Sadly not. I was almost there but I had forgotten one vital fact. Cooking on an Aga is different to cooking in a normal oven. Each Aga has it's own temperature that it runs at and although they're all basically the same, it's hard to know exactly where, say, 180° is in the oven. Aga recipes specify "runners" rather than temperatures as that's a better way of getting more consistent results, and Aga owners cook by moving the oven shelves up and down the sets of runners that line the oven walls to get the temperature they want. Although the bread that I made using the Breadtopia website was so nearly right, I realised that it was down to where I was cooking it in the oven, and what I was cooking it in. No knead bread in a conventional oven is cooked in a Dutch oven or a casserole dish with a tight-fitting lid but in my Aga, I found that I got a better result if I cooked my bread in the Aga cake baker. This is a large aluminium lidded pot with trivet inside that a cake tin rests on. The hot air circulates around the tin to cook the cake but keeps the temperature at a lower level than it would be just in the oven. At last! A few changes to the US recipe, a few versions of the sourdough starter, a change to how I was cooking the bread - and I'm now producing consistently tasty sourdough loaves in my Aga! I thought I'd share my technique so that anyone else wanting to cook sourdough in an Aga might find it easier than I did to get started. It's really not that hard, but from the problems I've had, you could be forgiven for thinking so. Right, so here we go. and this is what it looks like with the lid off. 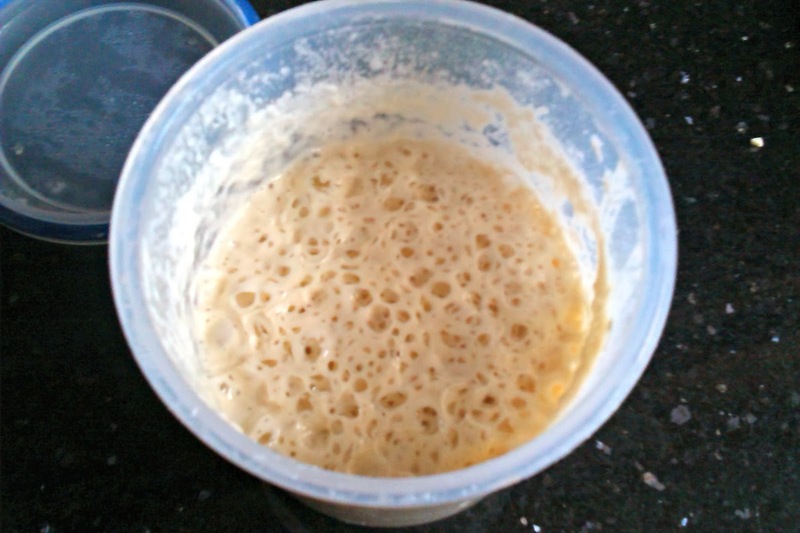 Plenty of bubbles means plenty of life in your starter which will make your bread rise. Try not to take the lid off other than when you're using or feeding your starter as that will make the bubbles disappear. Feeding your starter to keep it going after every use is also very simple; I just mix in half a cup of plain flour with a quarter of a cup of water. Now, this cup thing causes some confusion so the recipe I'm giving you later uses imperial and metric weights. Most American sites, however, measure in cups and my cups are Canadian which are different again, but I think it's safe to say that you can use whatever you like as a "cup" as long as you are consistent and use the same cup for all your measurements. My sourdough starter lives next to the Aga if I'm making a loaf every other day or so, but if there's going to be a longer gap than that, it goes into the fridge. You have to remember to take it out about 12 hours before you want to use it, give it a good stir and put it back into the warm place for it to start bubbling again. Now, on to the bread itself. I found a video on the Breadtopia sourdough page very useful and you might want to have a look at it yourself, but the basics of what you do are below. 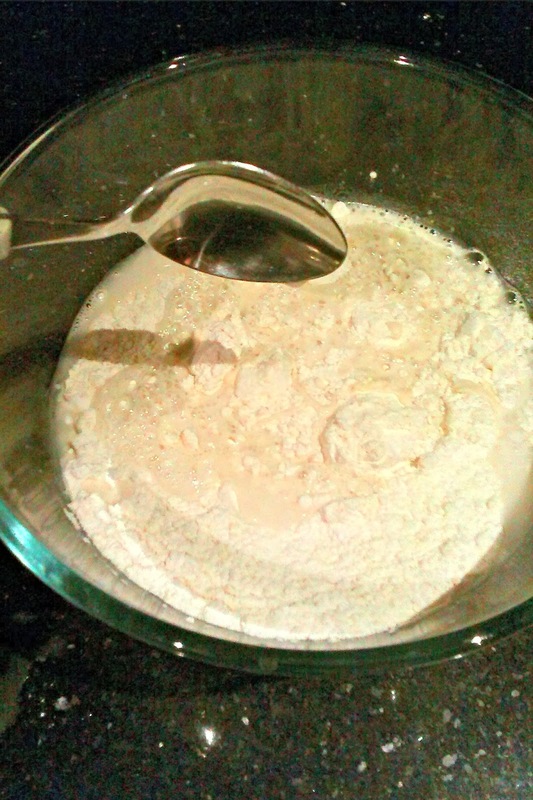 Weigh out your flour and salt and put them in a large bowl. 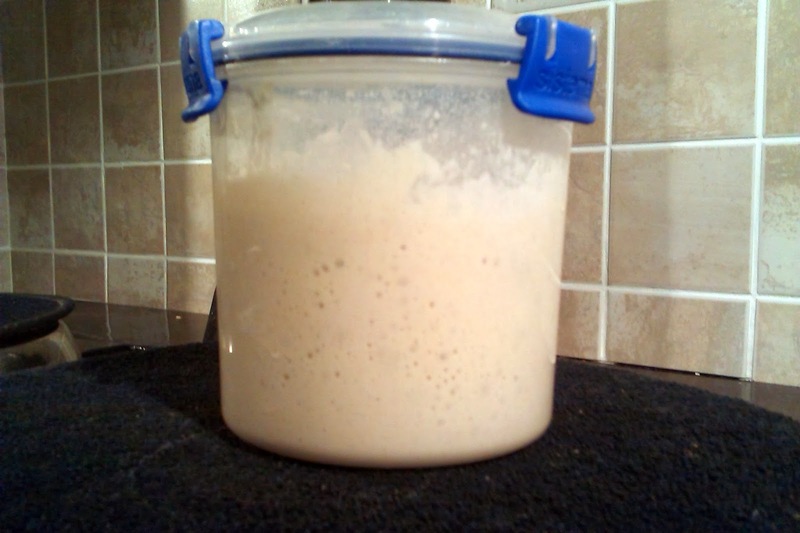 Give your sourdough starter a good stir before removing it from the pot. Mix the starter into the water and add that to the mixture. Stir it all together until it's mostly combined. Now, at this point, although it's called "no-knead" I've found that it's best if you do stick your hands in and knead the bread until all the flour is collected. You'll find the dough starts to get quite sticky and at this point it's best to leave it alone - sourdough can be incredibly sticky, although the stickier the dough is, the better it seems to rise - and as the whole point of it is not to cover yourself and your kitchen in dough, then it's time to leave the dough to rise in the bowl. Cover it with oiled clingfilm and put it in a warm place for about 18 hours. I tried leaving it next to the Aga but I think it was a bit warm, so if you want to try that, keep an eye on your dough and use it before the full 18 hours are up - over-proving will also cause the bread not to rise very well. After covering up your dough, the next thing you need to do is wash your hands and all your utensils in hot soapy water otherwise the dough sets like concrete and it's really difficult to get off (ask me how I know this!). After 18 hours, my dough looks like this. It's hard to see from the picture exactly what it's done, but it has relaxed and risen in the bowl. I don't know if I'd say it's twice the size; it certainly doesn't rise as much as an ordinary loaf does, but it has risen. The next thing to do is to spread the dough out on a floured board. I use a large chopping board but you can use the working top if you don't have a board big enough. Don't throw the cling film away as you're going to need it again in the a minute. This isn't as sticky a job as you'd expect, but you can sprinkle a little flour onto the dough as well if you're worried that it's going to stick to you. Fold the left side into the middle, then the right side over the top and finally fold the top of the rectangle that you have left in half to give this folded stack of dough (check out the Breadtopia video at this point if you need to). You can see the folds in the dough quite clearly. Cover the bread with the cling film and leave it to rest for 15 minutes. 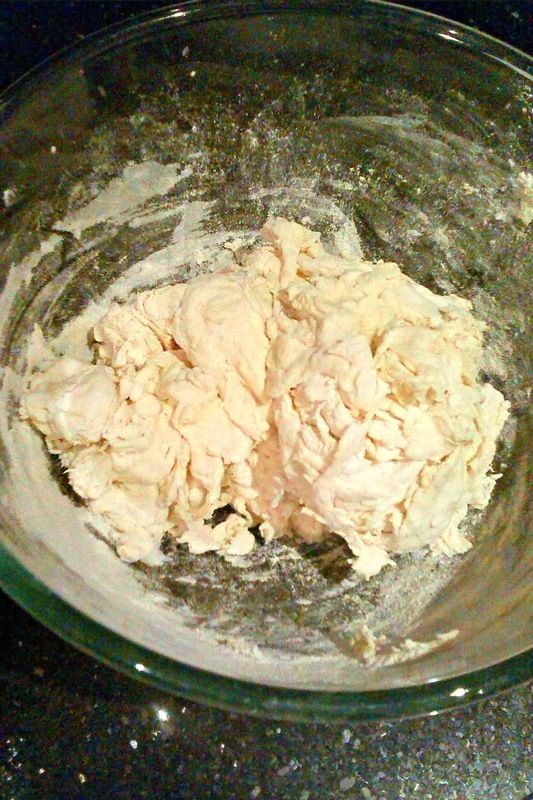 After 15 minutes, carefully pick up the dough and put it into a bowl to prove for another 1-1½ hours. I'm not sure that it really matters what sort of bowl you use, but I know there are plenty of bread aficionados who might choose to disagree. 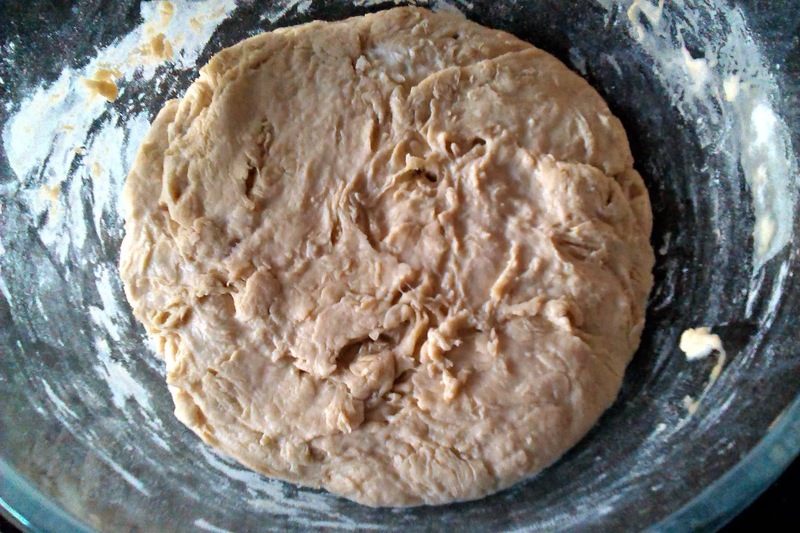 I've been putting my dough back into the same bowl that I mixed it in, covering it with the cling film again and leaving it (next to the Aga this time) to rise. The Breadtopia video uses a proofing basket and a tea towel instead of cling film. 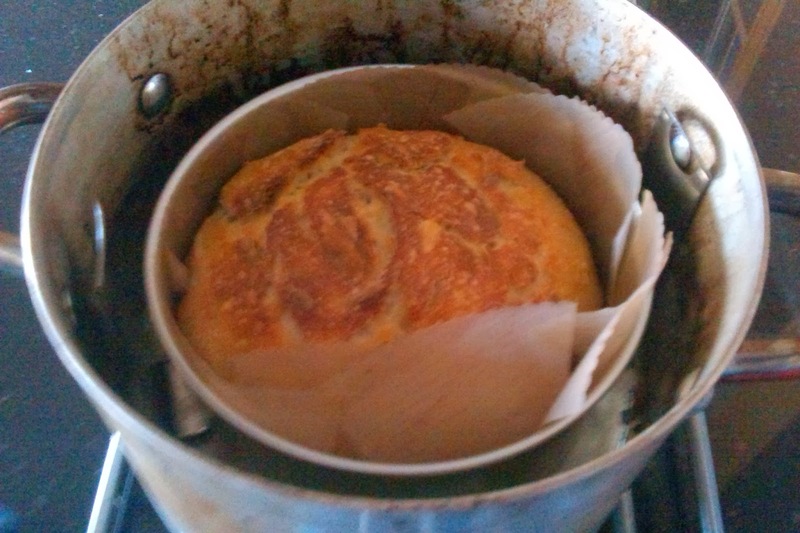 I don't have a proofing basket and found that my bread didn't rise as well with a tea towel, but I think the best thing about these recipes is that you can alter them to suit yourself to a certain degree so I would just suggest that you try it out for yourself and see how it works. After about 1½ hours, I put the Aga cake baker into the oven to warm up and I turn my dough out onto a 7" non stick circular cake tin liner. It's a bit sticky and squidgy at this point so I try not to touch it more than I have to and just drop the liner into the cake tin and then sit the tin inside the trivet. Once the cake baker pot has warmed up, I take it out of the oven and put the cake tin and trivet inside and then cook on the bottom of the roasting oven with the lid on for about 1 hour and 20 minutes, or until the crust is golden brown. This is my loaf, easily as tasty as any that we've bought, and more importantly, I can produce a loaf like this consistently by using this method which means that now we never run out of sourdough bread. Sourdough bread makes the most fabulous toast I think I've ever had, and although it might seem like a lengthy process to make, the no-knead method means that you actually do very little other than leave the bread to work it's own magic. You do need to think a little bit about the timings - for example, whether you are going to cook the bread during the day or in the evening, and then you work backwards from then to when you need to start your bread to give it the 18 hours' initial rising time. I was told that once you get into the swing of making sourdough, you never look back and I'm finally believing that it's true - I hope this helps you to feel the same way! Do let me know, I'd love to hear from you! Mix all of the ingredients together in a large bowl, using your hands if necessary to ensure that all the flour is incorporated into the mixture. Cover with oiled cling film and leave for 18 hours in a warm (but not too warm) place. 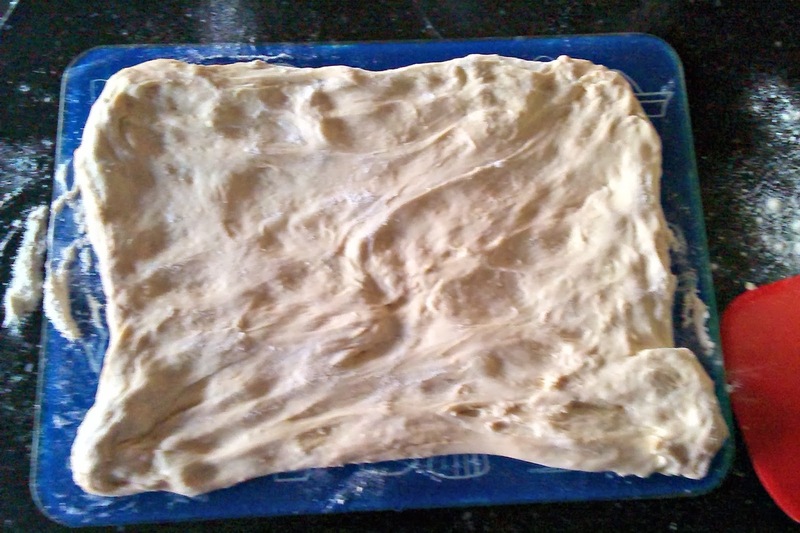 Turn the dough out onto a floured surface and spread out into a rectangle. 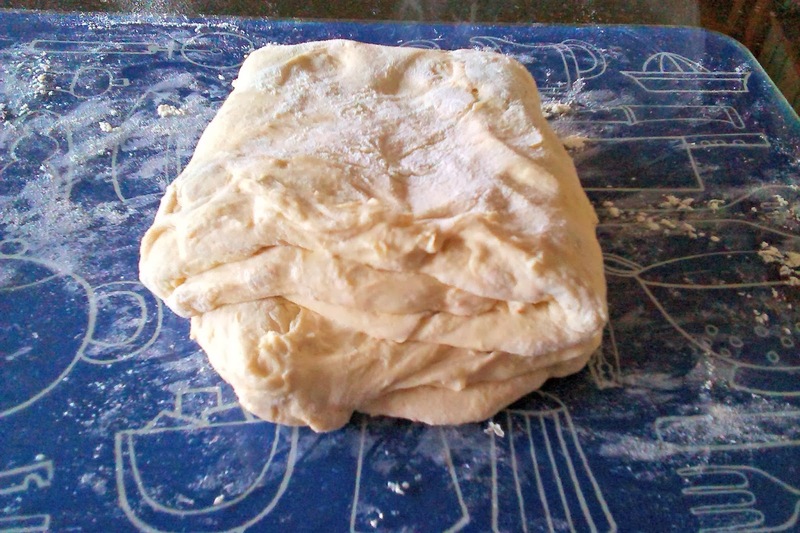 Fold the sides and then the top of the dough in onto itself, cover with the cling film and leave for 15 minutes. 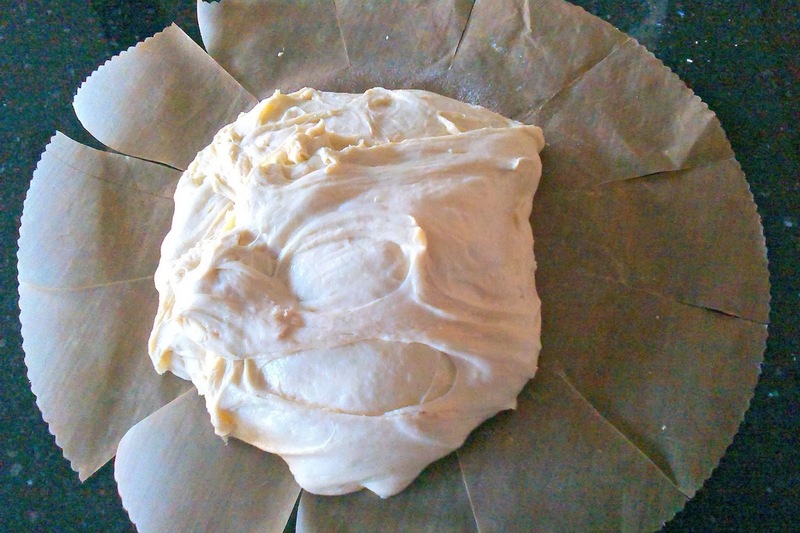 After 15 minutes, return the dough to the bowl (or use a proofing basket), cover with either cling film or a tea towel and leave to rise for another 1-1½ hours. Put the Aga cake baker into the roasting oven to heat up. 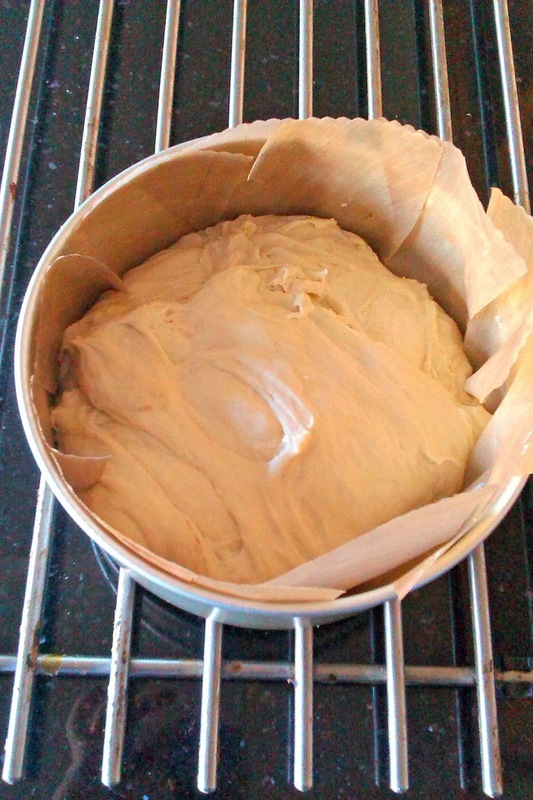 Turn the dough carefully out onto a cake tin liner, or straight into a well-greased cake tin and put into the trivet. When the cake baker is hot, remove from the oven, put the cake tin inside and return to the bottom of the roasting oven for 1 hour. After 1 hour, remove the lid of the cake baker for a further 15 minutes before removing from the oven and turning out onto a wire rack to cool. Danger at sea - without getting wet! Small daughter had great fun at the weekend trying a new Kindle book out. We don't have a Kindle but it was easy to download to an iPod with an app. 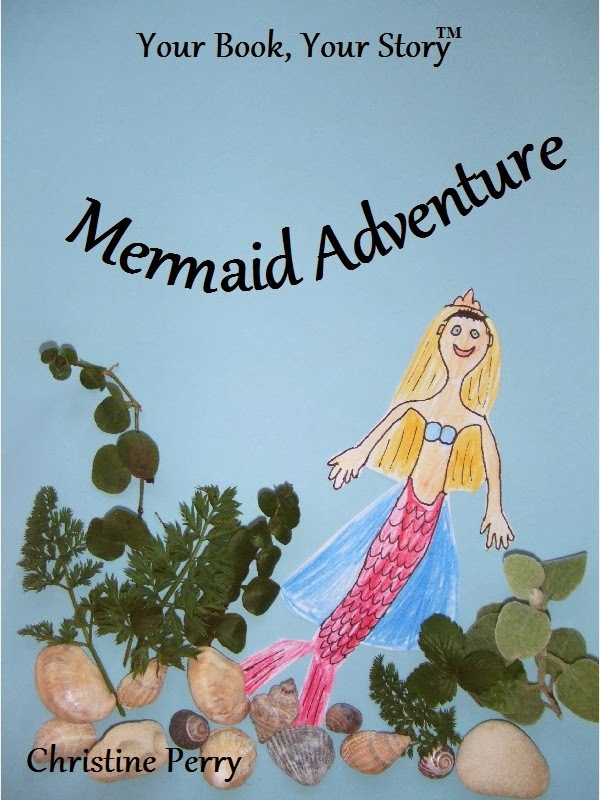 It's called Your Book, Your Story - Mermaid Adventure and it's an interactive book for children aged 4-9 who may or may not need any help to read it. I don't usually do reviews like this but I happen to know the author very well so I've made an exception in this case J. The idea of the book is to help to rescue a mermaid Princess who has gone missing. As the main character, you develop a tail and swim into an underwater world to join in the adventure. At the end of every page, you have to make a decision. Do you turn left or right? Do you speak to someone or not? Do you swim or hide? The choice is always yours and whatever you decide can help you to find the Princess or lead you into danger. Small daughter didn't need any help at all as the pages are short and the language is easy, but she did want to read the book with me so that she could see what decisions I made. Even big daughter had to have a go and it was lovely to watch the girls reading together. The best thing about this book is that you can make new decisions every time and read the story again and again. This would make it ideal for travelling or perhaps for reluctant readers who need an incentive to get to the end of every page, or for children who devour books at an expensive rate (I know a few of those!). I used to love books like this when I was younger, although they were often written as a fantasy game or in a rather more boyish style. This one was much more up small daughter's street, and I know the author has plans for more up her sleeve. Small daughter is already looking forward to the next one! 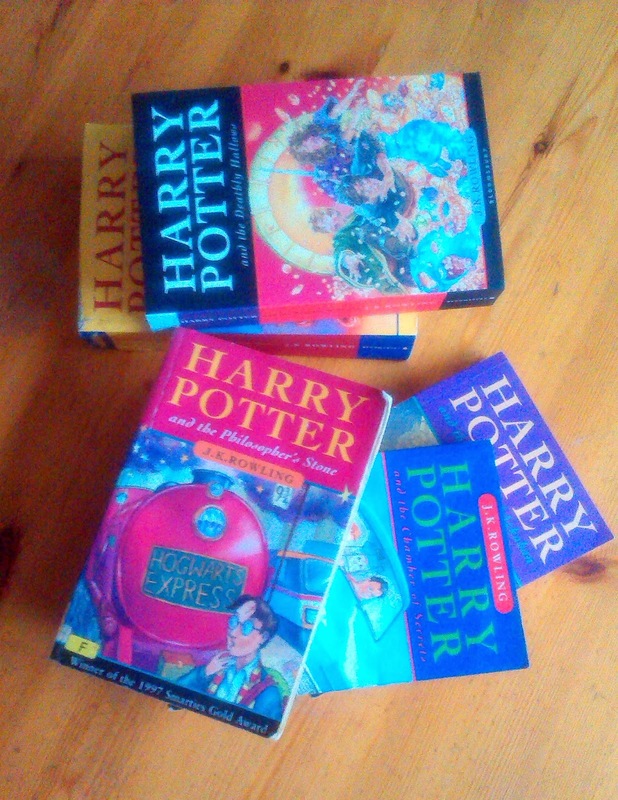 For some time now, small daughter and I have been reading the Harry Potter books at bedtime. We're gradually working our way through the whole series, although it's taking some time as the later books are huge and we don't always read a full chapter. Our collection of books is a bit battered - we've picked them up in library sales and charity shops as big daughter wanted read them all years ago, but they're all still readable and small daughter doesn't mind. I've never read the books before - all the hype that surrounded the books and the films when they were first published and in the cinemas put me off somewhat; I'm not one for hype. I'm glad we're reading them now, though. Small daughter is thoroughly enjoying them and I'm enjoying reading them to her. 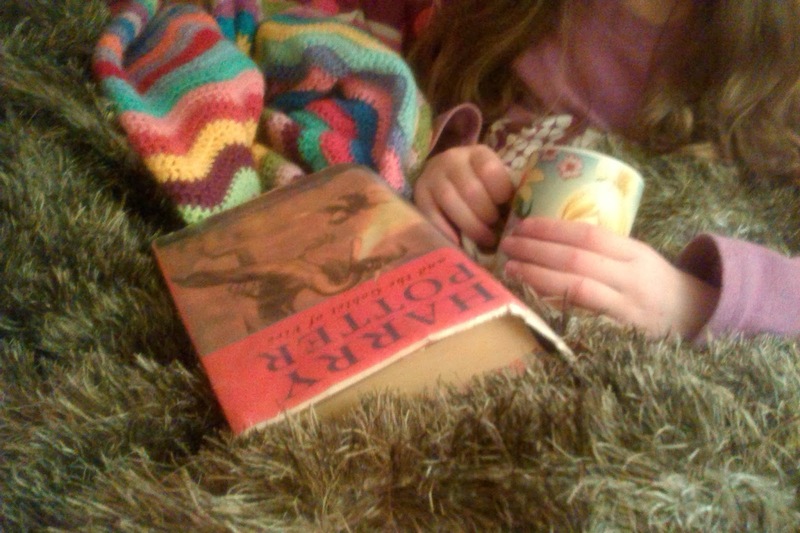 Sometimes she reads pages to me, but mostly she enjoys snuggling up in her bed, wrapped up in homemade blankets and just listening. Do we ever grow out of being read to? I don't think we do, otherwise there wouldn't be any demand for audio books. It's just that as we get older, we don't think to read to another adult any more unless they can't read for themselves. Reading - or listening to a story - is such a lovely way to get ready to go to sleep. It calms your brain in a way that TV doesn't. Sometimes small daughter will tell me that she's dreamed about being in the story and will recount fantastic night-time tales, her eyes shining as she remembers being able to conjure miracles from her wand. Spending time with a book before going to sleep is something that we all do in our family. I can remember getting out of bed when I was about small daughter's age to carry on reading my book by the landing light after I'd been told to go to sleep. I'm quite sure my girls do the same, although they use torches - at least, I think that's the reason I always find a torch under their pillows when I come to change the sheets! I've always read to the girls at bedtime - when else would have I the excuse to read such wonderful books as Hairy Maclary from Donaldson's Dairy (our favourite in the series is Rumpus at the Vet), Room on the Broom and the rather bizarre Avocado Baby which always had my girls hooting with laughter. Even my husband is an avid reader now (he read far less when I first met him) although his choice of books is very different from mine so we don't tend to share our reading material - think boys' books to go with the boys' films he watches! I'll be sorry when we reach the end of the Harry Potter series. It's been a lovely thing to share with small daughter, and it's been great that the books are all sitting on the bookshelf so we've been able to start a new book straight away without that frustrating pause whilst you go to the library or a book store or wait for a delivery to continue reading. I don't know what we'll be reading next, but I do know that I'll keep reading to her for as long as I can. 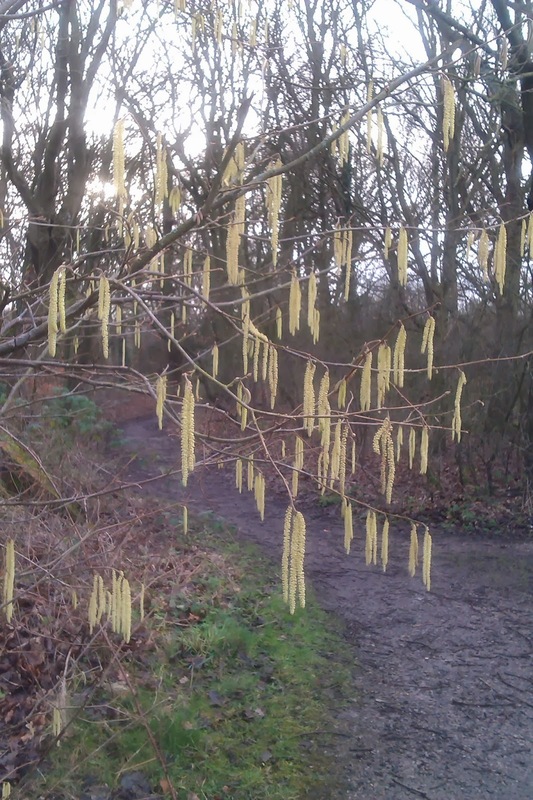 I spotted them everywhere this morning whilst the dog and I squelched through muddy woods. We haven't had a single snowflake this winter which does make me a little sad as I'm a real winter baby and love the snow, but instead there were little bursts of green that gladdened the heart in a different way. It's easy to walk along familiar paths without really noticing what's around you, but once one patch of green had taken my eye, it was impossible not to see buds and new life all around. 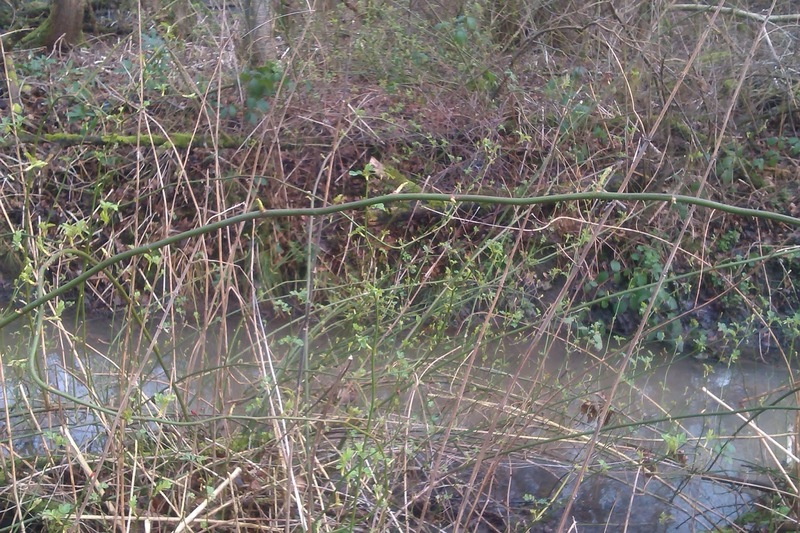 and new leaves on this wild rose. Just after I'd taken this picture, the dog launched himself into the water and then grinned his doggy grin at me as he climbed out and shook vigorously, leaving me almost as wet as he was. I'm quite sure he did it on purpose! I think he is enjoying the change in the season too; I've noticed him stopping to sniff the plants much more than usual. It's nice to see the signs of the world starting to warm up for the season, although I do worry what will happen to all the new leaves and shoots if we do suddenly get a cold snap. My garden is definitely a spring garden so I'm looking forward to seeing the colours unfold - daffodils, aquilegia, tulips (assuming the squirrels haven't eaten all the bulbs!) - it's a lovely time of year. It was the family service in church today. I don't go to church every week, but I do like the monthly family services as they always very inclusive of the children who attend - in fact, both my girls had a speaking part today! Today is Candlemas, the day in which we turn from Christmas to look towards Lent and Easter, so the church hall was filled with light from candles of all sizes. We're still not able to go into the church itself as the roof is still under repair, but the services in the church hall always feel very friendly and inclusive. People smile a lot and there's always a good feeling about the place. 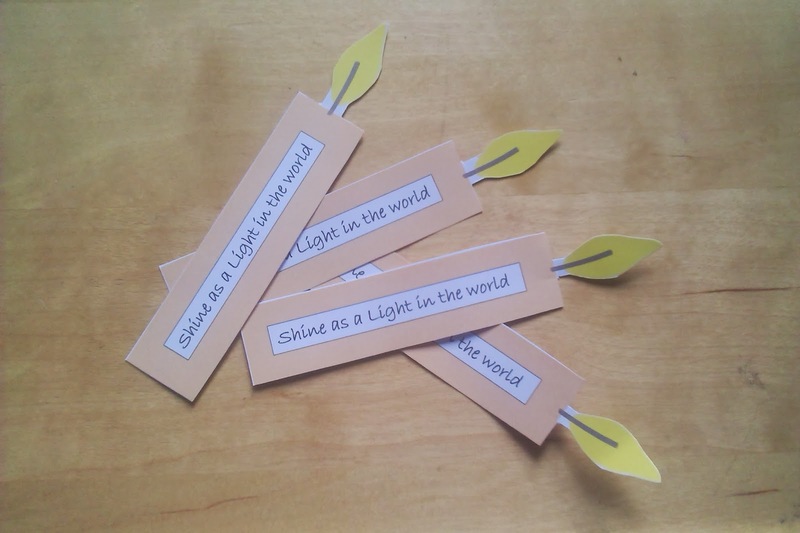 As part of the talk during the service, we were all given a small piece of card in the shape of a candle to remind us that we should let ourselves shine in the world. What a lovely thought that is! It reminded me of the poem by Marianne Williamson which I've written about before, but just fits beautifully with the sentiment of today's service. fabulous? Actually, who are you not to be? from our own fear, our presence automatically liberates others. Isn't that wonderful? It doesn't matter what your religious view are, we all have a light to shine and bringing it out to show the world and encouraging other people to do the same is something that we all should do more often. Someone told me recently that it’s a trait of human nature that we tend to disbelieve something positive about ourselves but will immediately accept the negative. Try it for yourself – it’s true. If someone tells you that you’re looking fantastic and they love the clothes you’re wearing, the chances are you’ll say, “Oh, this old thing, I’ve had it in the wardrobe for ages” and dismiss it without a second thought. However, if they say to you, “Are you OK? You look dreadful this morning!” you might reply, “You know, I am feeling tired, I’ve not been sleeping well,” even though you felt great when you got up. Why do we do this? Why are we so bad at accepting the compliments that would make us feel great for the rest of the day? And it’s not just about clothes, it’s about work, our relationships, our hobbies – it’s anything that we like to do for ourselves that makes us feel good. It’s as if we can’t accept that anyone else could possibly say anything nice without wondering what their ulterior motive is. Well, here’s a radical idea – what if there is no ulterior motive? What if someone said you looked nice or you were good at your job because you actually were? What if someone actually wanted to help you feel great about yourself because they understood that making you feel good made them feel good? I’ve written about the Law of Attraction before and about how you attract what you think about most into your life. You might think compliments about someone umpteen times a day but never say anything – and why not? Because we seem to be stuck in the belief that people don’t want to hear nice things about themselves, that’s why. We feel that they would be suspicious of our praise or wave it away so we might as well not bother. We are trapped in a cycle of not complimenting in case we are dismissed, and dismissing compliments because they come so infrequently that we mistrust them. Silly, really, isn’t it? Valentine’s Day is nearly upon us and the shops are already full of cards and gifts that we can give to our sweethearts to show them that we love them. It’s an opportunity to make up for all the times that we don’t say the words all year – but can presents and cards on one day really compensate for all those missed opportunities? It’s better than nothing, but I think we can do better than that. The basis of any religion is love – love for our partners, children and families of course, but also everyone else around us. “Love thy neighbour” isn’t just those living next door but every other human in the world. We don’t have to go round giving them hugs or making a big deal about it but a simple compliment, even to a stranger, can make someone’s day and will attract that same energy back to you. Yes, we mistrust positive praise but it’s only a habit that we’ve got into. The more we practice it ourselves, the more we will be able to accept it from others. Why wait for Valentine’s Day? Spread the love.